As the winter months roll in quicker than expected, we look to snuggle up by a fire. However, a real fireplace can often pose a fire risk to small children and homes without chimneys may require expensive installation. Luckily electric fireplaces can give you all the comfort of a real fireplace, without the tricky installation and dangers. Take a look at this guide to see which electric fireplace suits you, and where you should be looking to find the best deals. With this use of metal coils, electric fireplaces heat a room converting electricity to heat. The coils heat up with the electricity when the fireplace is plugged into a socket. And the air that passes over this coil is then heated. A fan is most often integrated into the design of an electric fireplace, which helps to blow the hot air out of the heater and around the room. The air circulates, with hot air rising, and cold air flowing to replace it. The cold air is drawn toward the electric fireplace and then heated over the metal coil. The aesthetics of the electric fireplace uses LED lights to create the impression of a real fireplace. Some include mirrors to give a more realistic feel of flames bouncing around. The light is refracted which gives the impression of dancing flames. They are a great safe option for small children as they are usually cool to the touch. 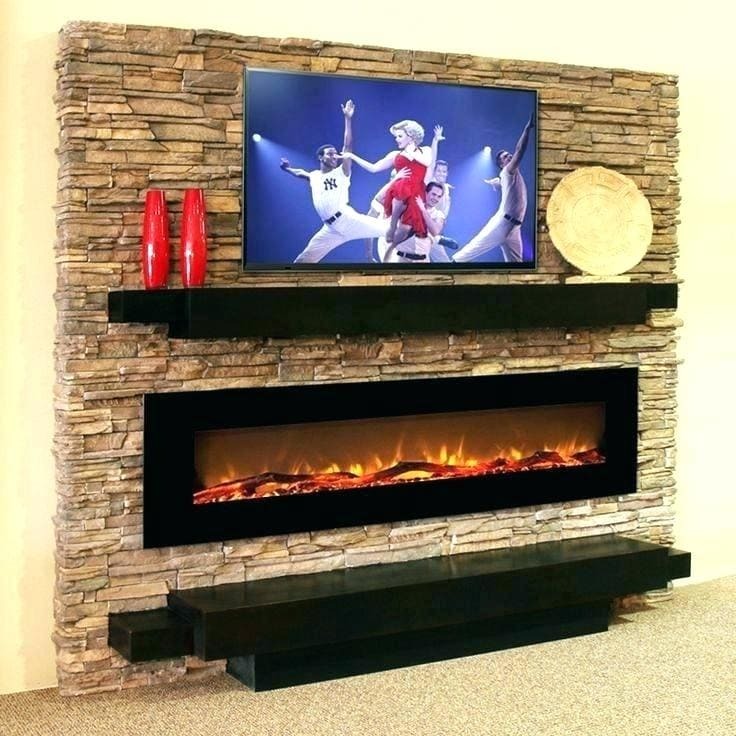 Depending on where you would like to place the electric fireplace, there are a variety of styles to choose from. You need to consider if you want something free-standing or built-in. As it will affect the type you choose and the final cost. If you want to place the fireplace on the wall, you can choose wall-mounted designs. They operate easily but do have a little more complex installation. They are usually very lightweight and can be hung at any height on the wall, limited only by plug socket placement. It looks more realistic when hung inside a fireplace, however. For those with fireplaces already installed at home, you may want to fill it with an electric fireplace insert to give the impression of a real fire. You can purchase fireplace inserts which sit in the original mantelpiece. They tend to have fires that have realistic looking embers and often can be controlled remotely. They simply slot in place and plugin. Electric fireplace stoves are another option that stands alone in the room. It doesn't need to be in a fireplace and is freestanding. They are highly cost-effective and energy efficient and don’t need to have ventilation built into your home to be used. 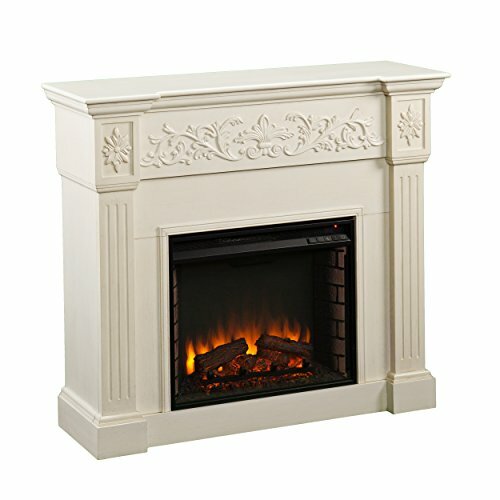 Mantelpiece fires are enclosed units designed and engineered specifically for mantelpiece fireplaces. They look like the traditional fireplace but work by using electricity. They are completely closed up and have a very realistic fire look to them. 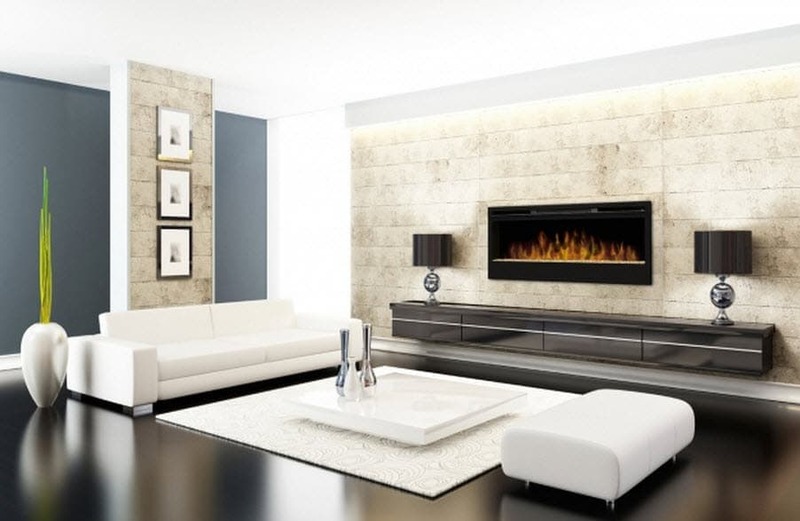 These models are a little more expensive than other types of electric fireplaces. With 5200 BTU of heat output, this heater is ideal for up to 1000 square feet of space. It has a 3D flame effect which gives off realistic flames. There are five adjustable settings to change the speed, color, and brightness of the flames. The infrared quartz design helps to prevent humidity. It is a very powerful heater, ideal for big spaces. This heater includes overheating protection as a safety feature. The adjustable flames make them very realistic, giving a cozy feel. The thermostat is adjustable, and the digital operation is easy to use. The heater element is quite loud which can be distracting. It does not have tip-over protection, making it a hazard for those with pets and small children. ​It is a powerful heater, designed to warm large spaces. It is easy to use, simple to install and includes features to prevent it from overheating. It doesn’t stop if it tips over though, which makes it a worry for those with kids. 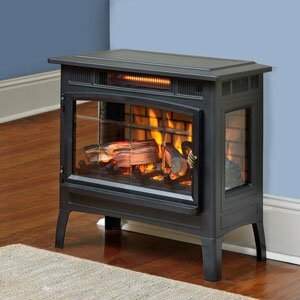 A supplemental heater for up to 400 square feet, this electric stove has 4600 BTU of heat output. 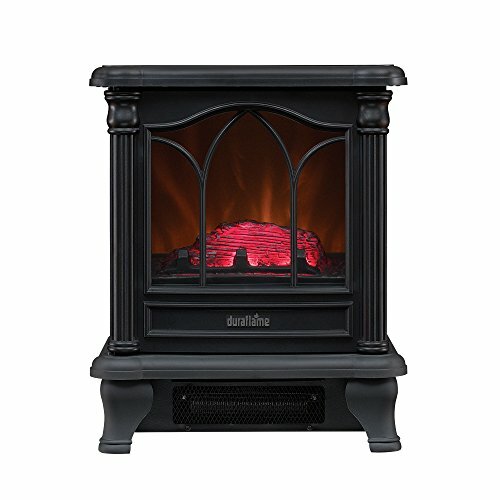 It is aesthetically designed with a homey window to view the realistic flame effects. It has tip-over and overheat protection and is cool to touch. It has a very homey aesthetics look with nostalgic log effects. This model is designed to save money through zonal heating. It is very efficacious and can easily heat more space than is stated. The safety features make it an ideal choice for pets and small children. It is smaller than it appears in pictures. This heater makes a small rattling noise. ​A compact heater, this model is designed to kick out a lot of heat for zonal heating. It is pleasing to look at and has excellent safety features. It features 100% energy saving LED tech. This electric fireplace insert showcases life-like log effects made from resin. There is a three-sided brick effect to create a quaint aesthetics. There is an electronic temperature precision control with a range of 60F to 84F. It is easy to install with a ‘plug-and-play’ installation. The logs are very realistic and give a comforting feel. This heater has a remote control for easier operation and convenience. There is an adjustable thermostat for more precise heating and better control of temperature. It smells a little when first heated up. It is less powerful than other models and should be reserved for smaller rooms. A great little electric fireplace for smaller rooms, this model can be controlled by a remote and is easy to install. The thermostat helps with easy control, and the logs give a quaint look. Engineered to look like a mantlepiece, this space heater works using radiant heat. It heats up to 400 square feet and can be controlled using the remote. It has an ivory finish with delicate trim and protective glass that is cool to touch. It has an elegant finish to brighten up the room. It is easy-to-install yet can be easily moved to another place. The cool touch front and child-lock on the remote make it a good choice for those with kids. This heater is smaller than it appears in pictures. The white ivory finish isn’t the same color as white paint. ​Although a little small, this heater is easy to move around and adds style to a room. Made from a variety of durable materials, it’s a good choice for people with children. Featuring an adjustable thermostat which can be remote controlled and a timer, this model has easy-to-use controls. It has a bookcase style finish in mahogany and cool-touch glass for safety. The shelving adds storage to the room. It has a beautiful classic finish to add elegance to any room. The cool-touch front makes it a safe choice to prevent burns. The timer and thermostat help to set a comfortable automatic room temperature. It can be a little tricky to assemble. This model is quite heavy so it cannot be moved around easily. ​Once assembled, this heater is easy to control and use in comfort. 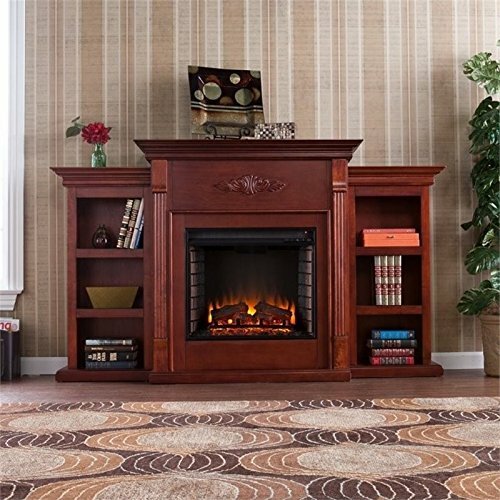 A little heavy to move, this sturdy fireplace adds a touch of class to any room. Remember to keep safety in mind when using any type of heater in your home. Keep it gated - Although many electric fires are designed to be cool to touch, some can get a little hot. If you have pets or small children, keep a gate around electric fireplaces that get hot. Turn it off at night - For those with remote control models, this is especially important. If your dog were to walk over the remote, this could turn on at night. Make sure to switch it off at the main power supply and unplug it. Keep it clean - As it gets hot and cools off, dust and debris may stick to the heated surfaces. This can lead to material degradation, as well as posing as a fire risk. Keep it clear - Don’t clutter things around the fireplace as it increases the risk of fire. Look for safety features - Tip-over protection will turn off the heater if it falls, whereas thermal protection will shut it off if it overheats. 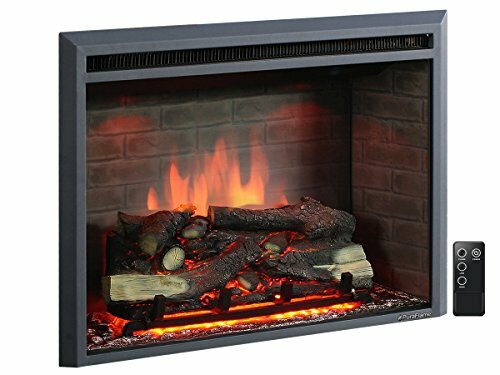 If you are looking to add the cozy nostalgia of a fireplace to your home, without having to knock in a chimney or worry about fire hazards, an electric fireplace is for you. Energy efficient, they give a beautiful homey feel, while easy-to-install into your home. Always remember to measure the place where you want to install it and ensure you find something powerful enough to heat the room in which you put it!